Nine nurses at Maine Medical Center in Portland are pregnant, all of them at once. And the delivery nurses have their due dates between April and July. And of the nine women is having twins! The soon-to-be moms are excited about it and said it is great to have so much support at work. The women plan to be there for each other's delivery and have been showing support since the beginning. 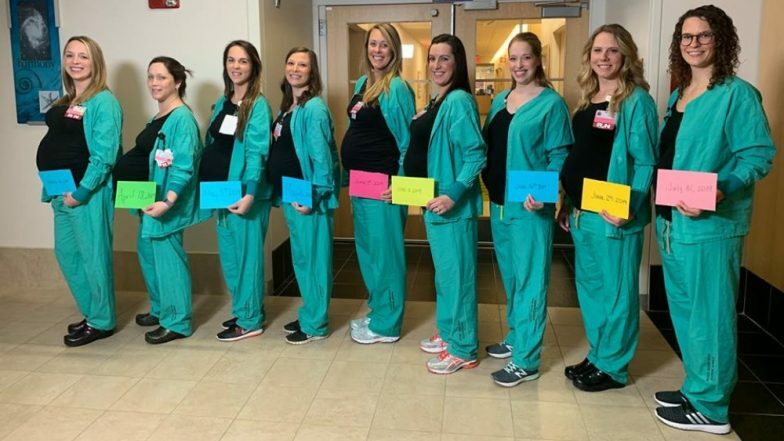 Congratulating the nurses, Maine Medical Center shared a picture of eight of nine pregnant women standing in a row showing off their baby bumps, in front of the hospital's delivery room with a note reading their due date. They captioned the picture saying, "How's this for a baby boom? Nine of our nurses (8 of whom are in this photo) are expecting babies between April and July! Congratulations!" The photo was quick to go viral on social media as congratulatory messages poured in. Last year, Arizona's Banner Desert Medical Centre in Mesa was in the news after 16 of their nurses became pregnant around the same time. Their due dates were between September 2018 and October 2019. The nurses in order of their due dates are Grenier, and fellow Registered Nurses Rachel Stellmach, Brittney Verville, Lonnie Soucie, Amanda Spear, Samantha Giglio, Nicole Goldberg, Nicole Barnes, and Holly Selby. WMTW quoted Amanda Spear as saying, "It's really nice coming to work and seeing other people who are just as pregnant and watching their bellies pop and just talking about these experiences that we are going through together." How To Get Pregnant: 7 Things That Will Help You Conceive Faster. But, won't the hospital fall short of hands when all of them go on maternity leaves? Well, the hospital has it covered too. There are 80 registered nurses currently working in the labour and delivery unit of the hospital. As the photo continues to be shared widely on social media, we can't help think about research by American Sociological Review which suggested that fertility behaviour may spread among friends. It says that the decision to have a child can positively influence people in your social networks.